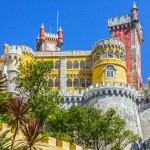 Discover the magic of Sintra on this hugely popular and highly rated small group tour. Tickets sell out fast – so avoid disappointment and BOOK NOW. 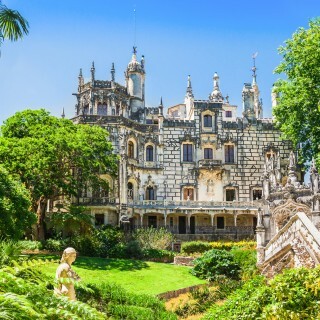 Experience the historical beauty of Portugal on a small-group day trip from Lisbon to Sintra and Cascais. 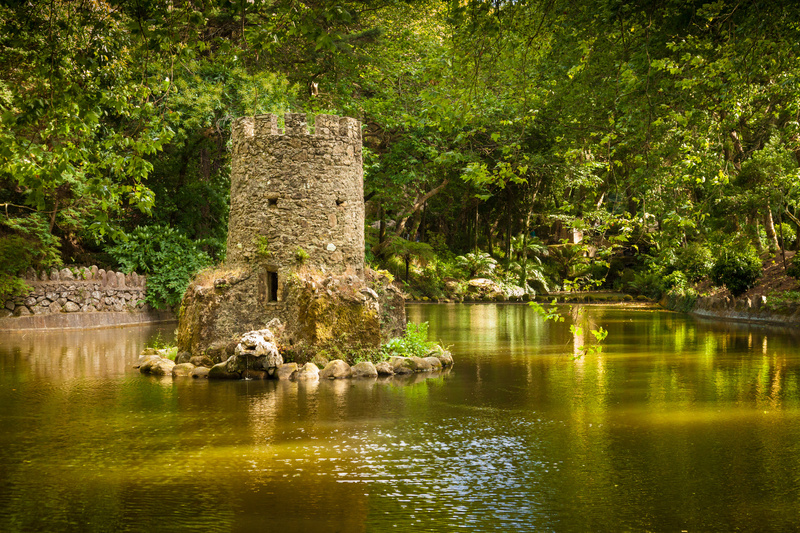 Just a few hours from Portugal’s capital city, Sintra is a magical place where man and nature exist in perfect harmony. Discover secret caves and trails at Pena Park, admire the natural wonders of Sintra Natural Park and the cliffs of Roca Cape, and visit the whimsical Pena National Palace. Enjoy a scenic drive along the Atlantic coast, and stop at Cascais Beach. Walk around Cascais town and bay. 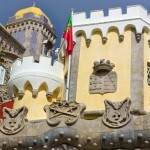 Just a short trip away from Lisbon are the beautiful towns of Sintra and Cascais. 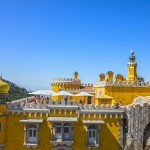 Start your tour with the journey to Sintra. 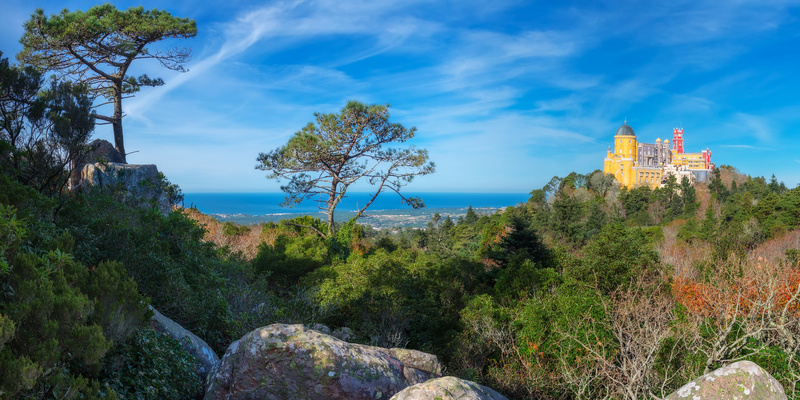 Visit Pena Park, where you will be amazed by the variety of trails, trees and other plants. 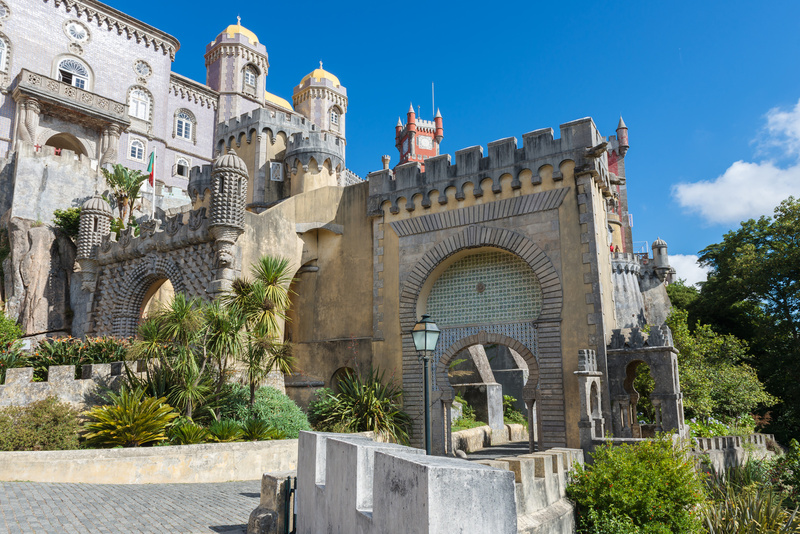 Head to the Queen’s Throne for an amazing view of the Pena National Palace (Palacio da Pena) and the Atlantic Ocean. 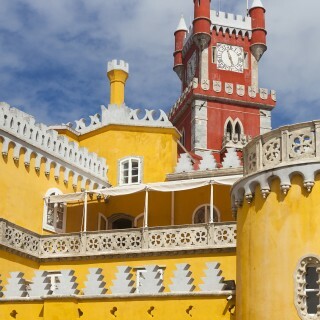 Next, feel like Portuguese royalty as you enter the romantic Pena National Palace at the top of Sintra Mountain. See the Great Triton, the guardian of the palace, inspired by Manueline art. Inside the palace, admire the attention to detail in the bedrooms of the king and queen and the Arab Room. 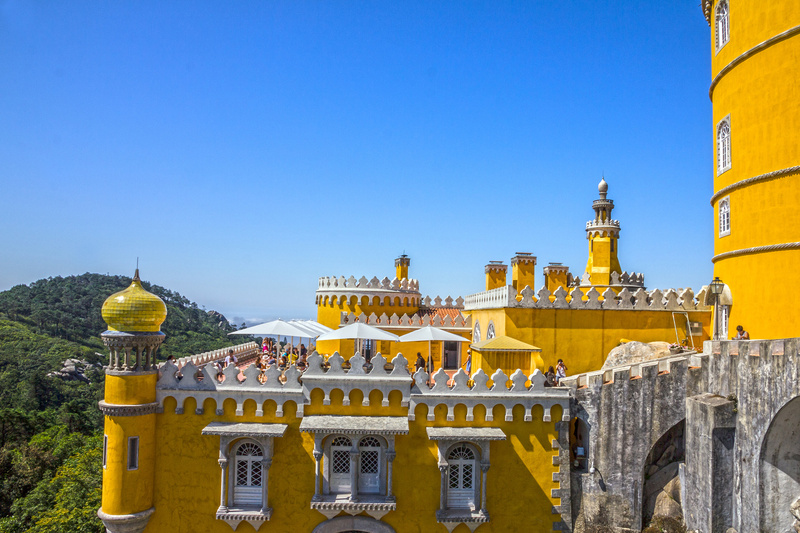 Leave the palace and follow your guide to the historical center of Sintra, where you’ll have free time to explore the town, to visit Sintra National Palace (where the Portuguese royalty of the 15th and 16th centuries used to spend the summer months) or have some lunch (own expense). For dessert, try a travesseiro or a queijada, two delicious local pastries. 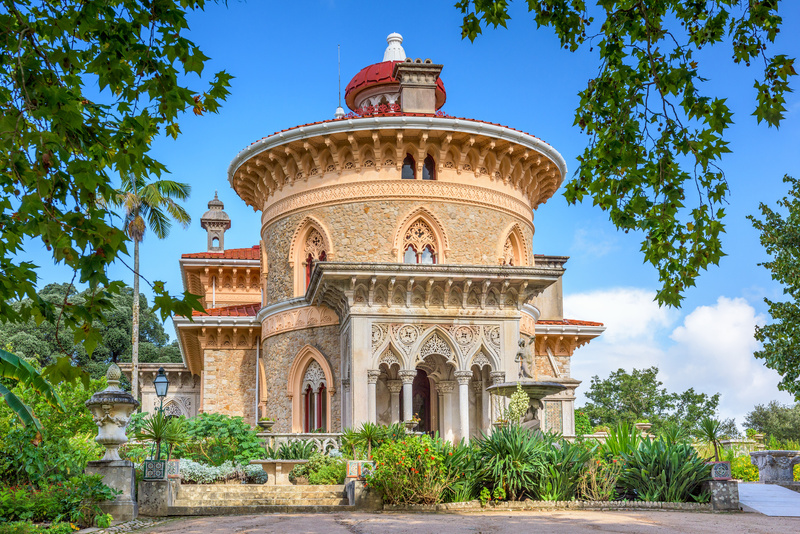 Next, admire the landscape of Sintra Natural Park, passing Quinta da Regaleira, Seteais Palace and the Palace of Monserrate on the way. Enjoy a photo opportunity at the cliffs of Roca Cape (Cabo da Roca), the westernmost point of Europe, and visit the surfer’s paradise of Guincho Beach. Pass the cliff at Hell’s Mouth (Boca do Inferno), before stopping to stretch your legs along Cascais’ bay. 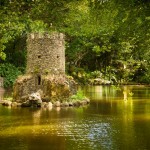 Wander around the center of Cascais, a former fishing village and today a popular holiday spot. Follow your guide through narrow alleyways and see the traditional Portuguese white houses or enjoy some time relaxing at the beach. On the drive back to Lisbon where your tour concludes, soak up the scenic views along the Atlantic coast and in the town of Estoril. This was a great tour, and I am really glad I chose the one I did. We got to see Sintra’s Pena Palace and some of the giant park that surrounds it, we got to see some of Sintra, Cascas, Cabo da Roca, and some more photo-opp stops along the way. Our guide, Joao, was very nice and knew a lot and was great at telling us information in an interesting way. Our guide was excellent, and the tour a highlight of our trip to Portugal. Super tour. Our tour guide Katarina was an great – very knowledgeable, excellent English, wonderful attitude. A credit to her company and a great ambassador for Lisbon and Portugal. If you book this tour, and your preferred language is English, then ask for Katarina! Fantastic tour made better by the services of our tour guide Joao Costa. A very friendly, knowledgeable guide who made sure we missed none of the sights on the tour, even stopping to show us things not included on the trip. 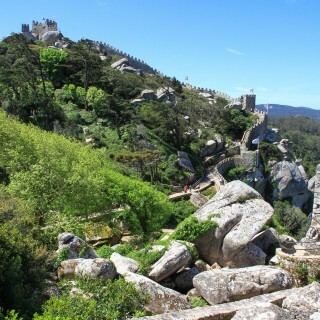 Sintra is a magical place and the palace is a must not miss experience. Joao made sure the trip went smoothly and did all he could to ensure our enjoyment of the experience. Excellent tour with a friendly and kind guide who was very knowledgable about the area. Great, efficient, and fun way to learn about Lisbon and make new friends. My girl friend Susan and I had a great time with Pedro as our tour guide. Pedro is a teacher, and knows Lisbon and it’s history extremely well. 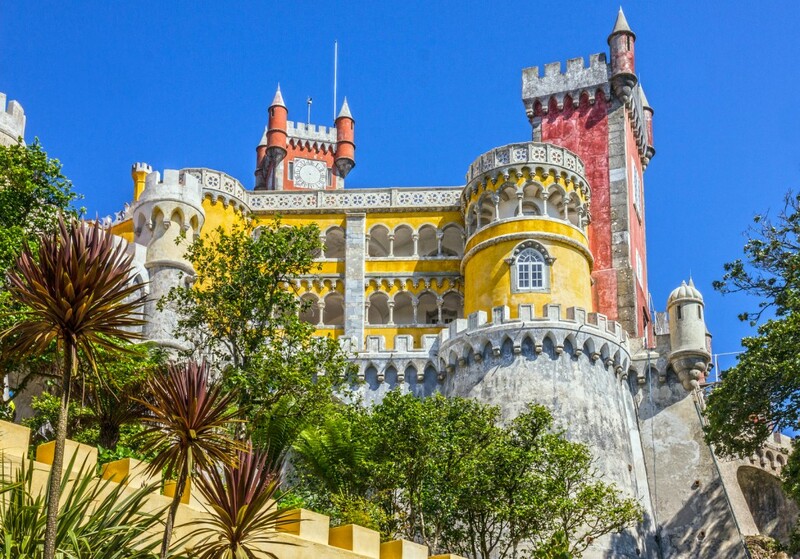 You simply can’t enjoy the history and culture of a place as beautiful as Lisbon and it’s surrounding areas without a local person to give you the real in-depth story. We also enjoyed the small-van experience and made new friends from China, San Francisco, and New York. Thank you Augustus for an incredible day in Sintra, Copa da Roca and Cascais! Tour was small and intimate, we learned a ton, got some good exercise and and #34;Gus and #34; is/was so approachable and kind. We enjoyed chatting with him about numerous Portugal cultural, historical and culinary topics too. Recommend! Excellent tour — our tour guide Pedro was very knowledgable and enthusiastic. Had a great time. This tour was a magical experience. It was everything you want from travel and from a day tour: a bit of a history lesson, a lot of cultural context, breathtaking sights and a stellar guide to show you the way. Gus, my tour guide, is one of the best I’ve ever had. Loved this tour! We all had a great time. 7 women Very informative, interesting and a good mix of listening to information and walking around seeing sites. My wife and I enjoyed this tour very much. Katarina was an excellent guide and did a great job making our small group feel very welcome. She was very friendly and made the trip very enjoyable in spite of the inclement weather we experienced through most of the tour. She was extremely knowledgeable about the history of the places we visited. I would highly recommend this tour. 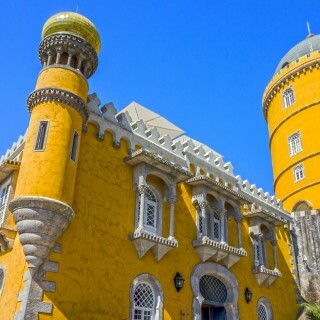 We were extremely pleased with our tour to Sintra and Cascais on November 4, 2015. Joao Corta was knowledgeable, conversant, and very pleasant. We would highly recommend this tour and viator after our experience with the tour guide whom we enjoyed very much. An excellent day out touring the area around Lisbon, led by a very knowledgeable guide, Rita. Thanks very much. This is one of the best place to visit in lisbon one day trip full of great places to see and our guide gave us lot of information the only issue it was raining too much and it needed more time. The tour was nice and the guide Alex is amazing. Alex was our tour guide. Very friendly, knowledgeable and personable. Small group experience was great and places visited were just right for the experience. Tour itself was excellent but just as importantly our tour guide Alexandra was superb, she made the tour as great as it was. kudos to her and Inside Lisbon tours. Joao Lisbon born and raised was funny, sarcastic, and a very informative guide. The tour covers everything in the description to the T. The tour does literally last all day, with a lot of driving between stops. There will be some steep hills to climb, so wear comfortable shoes. Get a good nights rest, otherwise you my fall asleep on the drives. Highly recommend this tour! 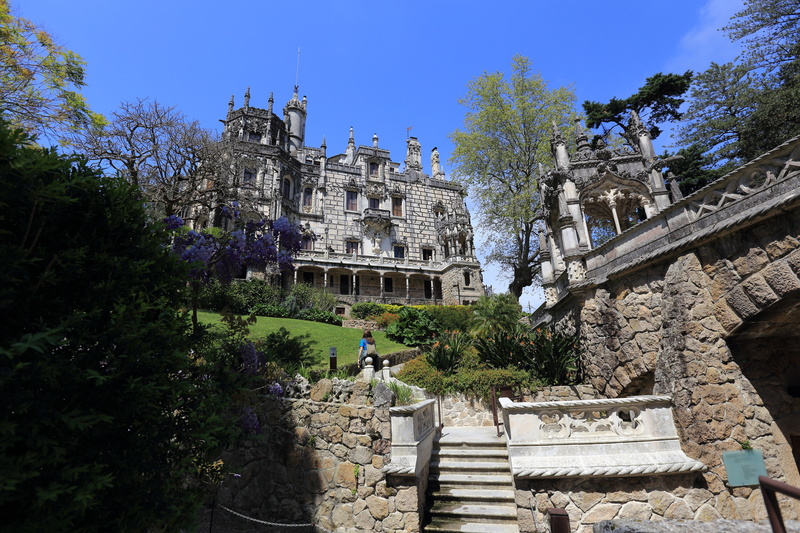 FYI – the temperature was about 70F in Lisbon, but in Sintra it was probably in the mid to upper 50’s. Bring a jacket, the wind and shade of the Forrest will have you shivering without it. We really enjoyed this tour. It was a perfect balance of time with our guide/group and independent time to explore. Our guide was very well-informed and gave us tips for lunch, local specialties, etc. that were helpful. 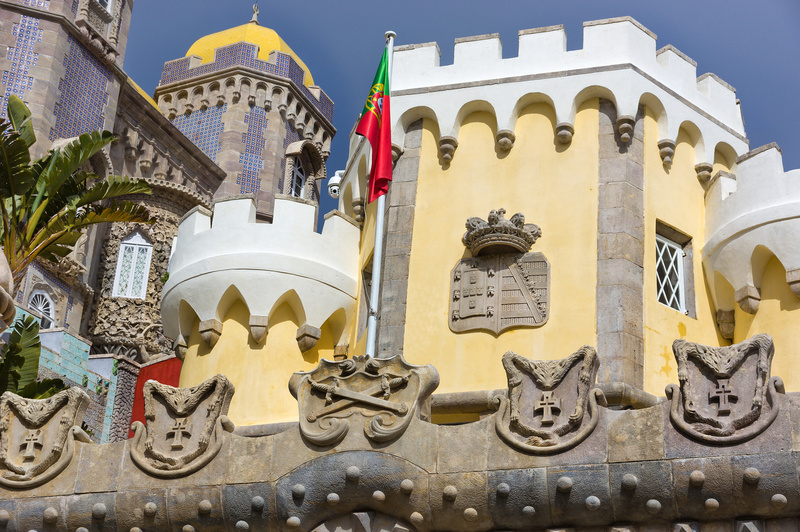 The stops on this tour were all fantastic — we cannot say enough for how impressive the Pena Palace was!